This post is to gain general interest numbers for the event. Separate ticketing information and payment links will be posted in the Members Only section when further details are available. Water and or Food Snacks: Water will be available. Catering options will be on site. We have heard back from OzCC, and this year, they are doing things a little differently. Fan Clubs. such as ourselves, have been given different space this year. We have effectively 12m x 4m of space, which includes a 3m x 3m changing area. This will ultimately allow for a banner backdrop, banners, 2 tables and some troopers in costume. Given the restrictions on space, we will need to be mindful of what you are bringing, when you are trooping and restricting the change/storage space to Rebel/501st Costumes only. If you are intending to costume as something else and it doesn’t fit within your Legion Costume box, then you’ll need to find your own storage solution. We have been advised by OzCC that there are several public restrooms available to get changed in, and there is also the carpark. All tickets cost $36.32 ($35 ticket fee plus PayPal fees). Any additional funds will pay for water and to cover transport costs for the larger props to future shows. Stay tuned as more information will be posted when it's to hand. 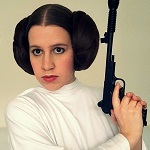 I’ll bring Porkins and Rebel Fleetie is a Leia would be amazing..